I love this little elephant - he's from the upcoming June Close To My Heart Stamp of the Month Set - Life's A Jungle. I know, I know - not much happening on my Blog lately - I'll try to work on that! Since I haven't done much on Splitcoaststampers either I put three challenges together for this card. The Color Challenge for today, A Sketch Challenge and a Ways To Use It Challenge. The Ways To Use It Challenge was to use your scissors to either cut out an image or add dimension to your card with cut paper - so I added stems and petals to the Stampin' Up! Felt Flowers - with the addition of little buttons in the center of the flowers. The sentiment "feel better soon" is from the May Close To My Heart Stamp of the Month Set - "Say It In Style". The Say It In Style Set is one of those set's that is a must have - it has a sentiment covering just about any occassion or holiday. 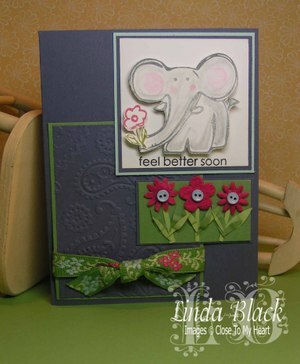 Hi Linda...Love the way you get the stamp to match the card! Terrific idea.